Like you, I’ve spent a lot of time growing, nurturing and ultimately preserving the bulk of our garden harvest. Now, is the time that we can truly reap those rewards and use up the precious conserves in our everyday meals. I think that making sure we use what we store, is very important. There have been many summer seasons when I start to make a new batch of jam, to only then realize that I still have 10 pints from last year (plus 4 from the year before) stacked on my pantry shelves. Typically, we spend a fair amount of time and money putting up food for our future use. It would be a crying shame to watch it end up in the compost pile, a few years down the road. In my opinon, our winter stores need to be regularly rotated to ensure their nutritional value and safety. Personally, I like to work in a 1-2 year cycle. This means that by the end 2015, all of our 2013 canned and frozen goods will have been consumed. There is plenty of evidence which shows that properly canned goods will survive on pantry shelves for much longer than a year or two, but whats the point? If we continue to grow vegetable gardens, and/or purchase produce from the local markets during peak season to preserve, then we will always have a continuous flow of food to feed ourselves. Another reason I have, for keep the food rotated, is space. I know how many jars I have to fill each year to keep our family fed. If I were to keep buying jars to fill each year, without using the previous years supply, then I’d be spending more money on not only jars but also to build more shelves to store those jars. The same goes for freezer items that are preserved. If the previous years worth of food is not fully consumed, then I might need to go and buy another freezer (using more electricity) to store the new seasons harvest. This conversation brings up few major questions. How much canning do I need to store for my family, for a year or more? … and … How do I make sure that I use up what I have stored, in time for a new batch to hit the shelves? … and for a new blog post topic .. How much food do I need to grow to feed my family? Only you can calculate the amount your family will consume of each canned item, each year. To help you get the idea of how to calculate the amount needed, I’ll use our household as an example. Rule number #1~ Only preserve the types of food that your family will eat. Tomatoes – Each year, I make plain-raw tomato puree that I freeze in flattened baggies (or milk cartons) for home-made tomato soup & “fresh” salsas, I can tomato sauce for pasta-stews-chilies, some barbeque sauce for pulled pork & chicken, and lots of salsa each year. I also dry tomato slices for sun-dried tomatoes. I have a similar list made up for our other favorite preserves. We like dill pickles(8 quarts), some sweet mixed pickles with cauliflower(6 pints), mustard pickles for summer beach hotdogs & chopping into potato salads (10 pints), spicy red hamburger-type relish for burgers & adding to tuna salad (6 – 1/2 pints). We don’t eat toast for breakfast and therefore, I don’t make a lot of sugar-filled jam. However, I did some blackberry jelly 1/2 pints in 2012 that I used in thumbprint cookies, and plum jam that I used Asian-inspired sweet & sour sauce. Last year, I made some yellow-cherry-tomato-peach-chutney that I used in East-Indian dishes. I choose to freeze or dehydrate most of our fruit & berry harvest, instead of canning it. I also canned some green beans (24 pints), beets & pickled beets (12 pints) that I use in Borscht and 12 1/2 pints of apple sauce for muffins. In 2014, I pressure canned 24 quarts of vegetable & 24 quarts of chicken stock. For the vegetable stock, I kept a large pot on the stove to collect all kinds of odd looking veggies & compost peelings from the garden. Once the pot was full of onions, carrots, celery tops, cilantro stems, overripe tomatoes, parsley, parsnips, beets and mature beans, I added water and simmered it with some peppercorns & sea salt. I save roasted Chicken carcasses in the freezer until I have 4 or so, then simmer them with a load of vegetables, onions & herbs as mentioned above. We use at least one quart of stock per week in soups, stews and other recipes. 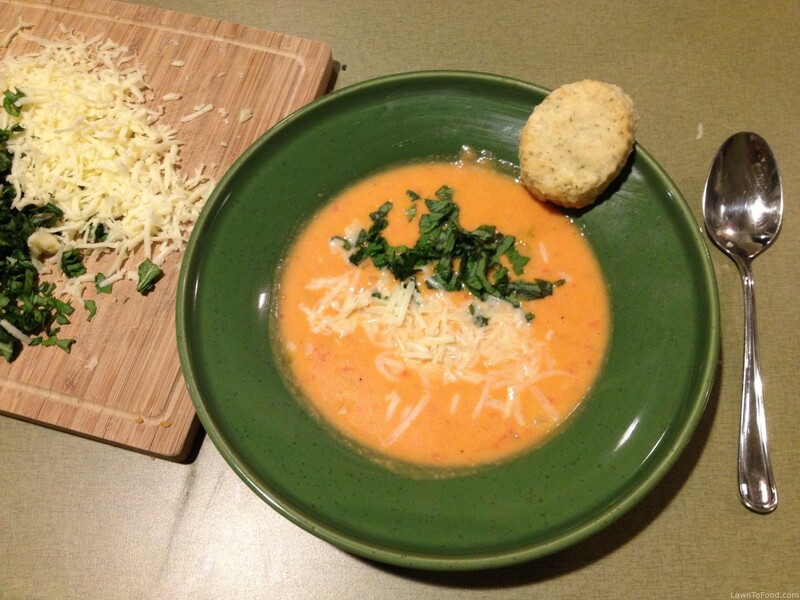 Today, I am going to use up some frozen, tomato puree to make this creamy soup for dinner. What are you going to use up from your pantry and preserves? This entry was posted in Let's Eat, Preserving & Using Preserves, Reep the Harvest and tagged food, pantry, relish, soup, stock, storage by Lynda. Bookmark the permalink.